Songbird Creations: Review the Ancients: Trantor: The Last Stormtrooper. Review the Ancients: Trantor: The Last Stormtrooper. A ship pierces the night sky and descends into a narrow canyon. The red walls of rock rise slowly as the ship makes it's perilous journey into the unknown depths below. The ship's radar dish rotates rapidly, scanning the area for a signal. Eventually, the ship arrives at a landing platform - it extends the landing gear and retracting it's wings. A solitary figure emerges from the ship and beckons for his companions to disembark. He runs from the ship and is blown to the floor as the ship disintegrates. The lone survivor stands, takes a fleeting glance at where his ship and comrades once stood and looks away towards his destination. The title menu appears, neatly animated - accompanied by an impressive score rendered expertly on the 48k beeper. Quite how David Whittaker managed to get such sounds out of the beeper is entirely a mystery to me. The game starts, revealing a large character, taking up a third of the screen with amazing detail and colour. On command Trantor runs to the left or to the right with incredibly fluid animation - again, unheard of. An alien drone appears and flies at his head, Trantor ducks and the drone flies onward. Another drone appears on a course with his chest, no ducking this time. 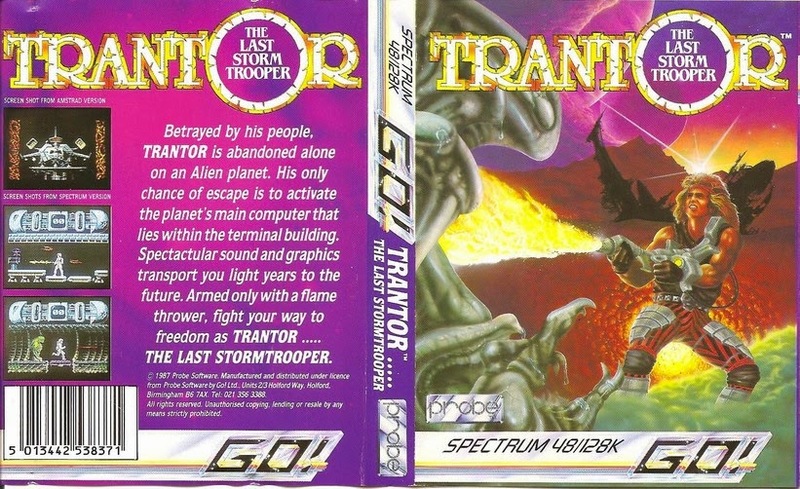 Trantor pulls the trigger on his weapon unleashing a jet of flame - immolating the alien and it's companion behind it. He realises that he cannot stay still and runs. The place is infested. He must escape. The place is also littered with environmental traps. Pistons emerge from ceiling. Trantor has to carefully time his run to avoid being hit by the pistons whilst also avoiding the drones. He could fry them, but then his napalm supply is limited. With each hit from a piston or collision by an drone, Trantor's health is reduced. After a perilous few seconds, he reaches a locker. Inside is a burger. He eats it and replenishes his health. Next to it is an elevator leading down to the lower levels of the base. He decides to explore more of the base before going down and discovers a napalm stash. Further exploration reveals a computer terminal. Activating the terminal sends out a transmission. A transmission is received - and the timer is reset to 90 seconds, he is also presented with a code letter. Trantor must find more terminals within the time limit, download the letter and enter the code into the mainframe to have any chance of rescue. He takes the elevator down. The base looks similar to before, only there are pistons rising from the floor. He knows the drill, kill anything that moves, search the lockers, find the terminal and refuel his flame thrower. Then find the elevator and descend. The third floor looks different. Instead of the industrial platforms, he is faced with brick floors and ceilings as well as spikes intent on ruining his day. The drone presence has also intensified here who attack him from every direction. He decodes the terminal, receives another code letter, finds fuel and food and the next elevator. This elevator goes up to an unusual set of corridors. This level is strange, alien even, ribbed walls in green and yellow suggested that he'd entered somewhere far more hostile. However the floating robot drones which had proved so troublesome were not to be seen. Any calm which the absence of drones afforded him was quickly quashed when an alien standing at least 9 feet tall appeared, it's jaws containing sharp teeth and it's muscular body suggested that melee combat would be inadvisable. A blast from the flame thrower saw it off as another appeared behind him. Trantor ran. In spite of the rich story which is told by the amazing visuals (for the time), the gameplay is shallow, a simple matter of run, jump, duck and fire. The aliens can only be killed by the flame thrower if at chest height meaning that most of them impact with the trooper as he runs around the level. The alien drones seem to explode on contact with Trantor, meaning that they must exist in a perpetual state of terror as any collisions would spell their doom. Impacts with pistons and spikes also a fairly unavoidable. Both hitting aliens and moving environmental hazards drain precious health and make for a fairly frustrating journey between health stashes. It does add tension though, especially as not all lockers contain food. Sometimes you get extra time, other times you'll get a screwdriver which offers seemingly no value to the game. Other times you'll get a shield or more napalm. There seems to be a 1 in 3 chance of getting food. Enemy encounters are random and frequent, however they pose little threat until you reach the 9 foot tall monsters - who eat your head. The fact that it is impossible to avoid being hit by enemies is the most frustrating thing. It detracts from the feeling of control. Surely Trantor wouldn't allow himself to be hit in the head by anything. Surely he would at least aim his flame thrower. The visuals are fantastic though - especially considering that the game runs in 48k of memory. This means that the animation for the trooper, the flamethrower, each alien, the background graphics, the game code, the music and even the intro sequence all fit within 48k.. That's 49152 bytes. Just for comparison, the low resolution scan of the box art at the top of this review weighs in at 186k. Trantor would fit into that jpeg file almost 4 times. The animation for the main character is fluid and conveys a sense of mass. His flame thrower shoots out fire impressively. Visually, the game was leaps ahead of the competition (even if the graphics were rendered using an xor technique instead of masking - although given the amount of graphics involved they are forgiven ). The alien movement is a little awkward and the 9 foot tall aliens pop into the side of the screen instead of appearing smoothly. The game is also quite short, but hard and very tense. There are no lives. Once dead, you start again. No checkpoints or hand holding in any way. On release, the game received a lot of praise in the gaming media - particularly because of the graphics, often overlooking the simplistic gameplay. The backstory was also a little ambiguous. One spectrum magazine ran a preview for the game with a detailed backstory which included betrayal, an alien war and a 90 second timer for a bomb in Trantor's head which would explode if not constantly reset. Whereas the Amstrad case inlay reported that this was all in trantor's head as he struggled with the accidental death of a child. In the end none of this mattered. I fondly remember the game for the tension it caused. I certainly felt it and genuinely freaked out when the large aliens were after me. I wonder what Trantor would look like if it was remade today - possibly it would play like Abuse, another tense and often terrifying game. I would love to see this game re-made. If you can find the original tape, on the B-side, there's music from a Rock band called Resister titled "The Fight"
Making a Game in a Weekend with MonoGame.